Our Kraft side gusset bags are perfect for taking home treats from the bakery. The KSG1 bag measures 2 3/4" x 2" x 10" and works great for cookies, brownies, cake pops, donut holes, and more. A paneled window runs the length of the bag for a full view of your goodies. The inner lining is grease-resistant for easier loading of baked goods. 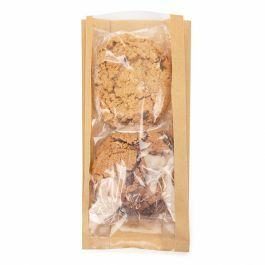 Kraft side gusset bags offer a clear product window to showcase baked goods. Our KSG1 bag measures 2 3/4" x 2" x 10" and is perfect for baked goods like cookies, brownies, cake pops, donut holes, and more. This Kraft bag has a clear front panel that runs the full length of the bag for a tempting view of your goodies. Side gussets allow extra space for bulky products. The inner OPP layer offers a grease-resistant surface making it easy to load baked goods and retrieve them from the bag. This bag works great for display or for take-away items from the bakery, cafe, or deli. FDA approved. Outer Dimensions: 2 3/4" x 2" x 10"
Most popular use of KSG1 is for packaging baked goods.